You've probably gulped down a meal or two when you've had more obligations than time. The occasional rushed meal won't cause many problems, aside from a stomachache now and then. But if you're the kind of person who looks up from your empty plate and notices everyone else is only half done, slowing down your consumption might do your body some favors. When you eat too fast, you increase your risk of indigestion, according to MedlinePlus, a service of the U.S. National Library of Medicine. Indigestion has many symptoms, ranging from a burning sensation to a heavy feeling -- like you ate rocks for dinner. Sometimes indigestion symptoms are so severe, they're mistaken for a heart attack. The discomfort usually subsides when the body has a chance to break down the quickly ingested food. If your indigestion persists, talk to your doctor about acid reflux, irritable bowel syndrome or other complications associated gastrointestinal discomfort. Your brain and stomach work together to control your appetite. This process isn't instant. In fact, it takes about 20 minutes for your stomach to communicate to your brain that you've had enough to eat. If you eat too fast, you pile on the calories before your body has a chance to tell you that you don't need them. Eating too quickly increases the chance that you'll need more food to feel full, because you're relying on stomach discomfort or emotional satisfaction instead of brain signals to tell you when to stop eating. When you consume too many calories, you gain weight. 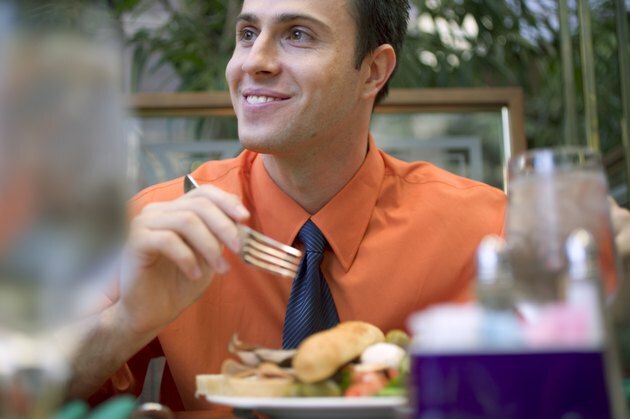 If you eat so fast that you regularly skip the body's process of recognizing its own satiety, you may become disconnected with your natural hunger and fullness signals, according to Peace Health Medical Group of Washington, Alaska and Oregon. Over time, you stop feeling hungry or full at all and instead rely on your desires and emotions to tell you when to eat. If you slow your eating and practice listening to your body's physical signals before and after meals, you can reconnect with your natural hunger and fullness signals. Because it takes about 20 minutes for your stomach to tell your brain that it's full, try to stretch your meals out for at least 20 minutes. This may seem difficult, especially if you're used to downing a burger in the car on your way to class, but it can be done. Put your fork down between each bite and chew thoroughly. Use the dinner table as a time to discuss your day with your family and friends. If you finish your meal before the 20-minute mark, wait until the whole 20 minutes have elapsed before deciding if you need more to eat. How Does Your Stomach Tell Your Brain That You're Full? How Long Does It Take Your Brain to Register That the Stomach Is Full? Can Peanut Butter Cause Indigestion? Is it Better to Sit or Stand While Eating?